This example shows how to solve a mixed integer engineering design problem using the Genetic Algorithm (ga) solver in Global Optimization Toolbox. The problem illustrated in this example involves the design of a stepped cantilever beam. In particular, the beam must be able to carry a prescribed end load. We will solve a problem to minimize the beam volume subject to various engineering design constraints. In this example we will solve two bounded versions of the problem published in . A stepped cantilever beam is supported at one end and a load is applied at the free end, as shown in the figure below. The beam must be able to support the given load, , at a fixed distance from the support. Designers of the beam can vary the width ( ) and height ( ) of each section. We will assume that each section of the cantilever has the same length, . where is the bending moment at , is the distance from the end load and is the area moment of inertia of the beam. where is the deflection of the beam, is the energy stored in the beam due to the applied force, . where is the moment of the applied force at . where is the area moment of inertia of the -th part of the cantilever. Evaluating the integral gives the following expression for . Now, the end deflection of the cantilever, , should be less than the maximum allowable deflection, , which gives us the following constraint. We are now able to state the problem to find the optimal parameters for the stepped cantilever beam given the stated constraints. For the problem we will solve in this example, the end load that the beam must support is . We now solve the problem described in State the Optimization Problem. Examine the MATLAB files cantileverVolume.m and cantileverConstraints.m to see how the fitness and constraint functions are implemented. A note on the linear constraints: When linear constraints are specified to ga, you normally specify them via the A, b, Aeq and beq inputs. In this case we have specified them via the nonlinear constraint function. This is because later in this example, some of the variables will become discrete. When there are discrete variables in the problem it is far easier to specify linear constraints in the nonlinear constraint function. The alternative is to modify the linear constraint matrices to work in the transformed variable space, which is not trivial and maybe not possible. Also, in the mixed integer ga solver, the linear constraints are not treated any differently to the nonlinear constraints regardless of how they are specified. Create vectors containing the lower bound (lb) and upper bound constraints (ub). To obtain a more accurate solution, we increase the PopulationSize, and MaxGenerations options from their default values, and decrease the EliteCount and FunctionTolerance options. These settings cause ga to use a larger population (increased PopulationSize), to increase the search of the design space (reduced EliteCount), and to keep going until its best member changes by very little (small FunctionTolerance). 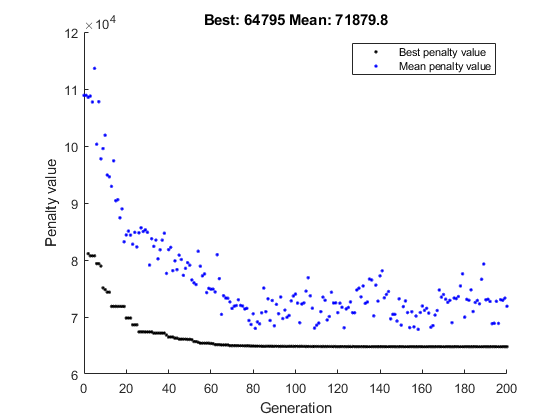 We also specify a plot function to monitor the penalty function value as ga progresses. Note that there are a restricted set of ga options available when solving mixed integer problems - see Global Optimization Toolbox User's Guide for more details. We can now call ga to solve the problem. In the problem statement and are integer variables. We specify this by passing the index vector [1 2] to ga after the nonlinear constraint input and before the options input. We also seed and set the random number generator here for reproducibility. If a problem has integer constraints, ga reformulates it internally. In particular, the fitness function in the problem is replaced by a penalty function which handles the constraints. 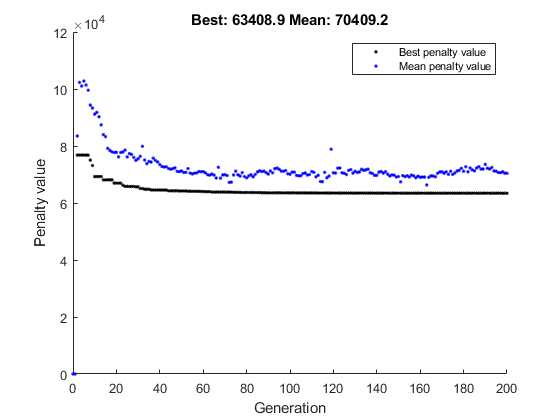 For feasible population members, the penalty function is the same as the fitness function. The solution returned from ga is displayed below. 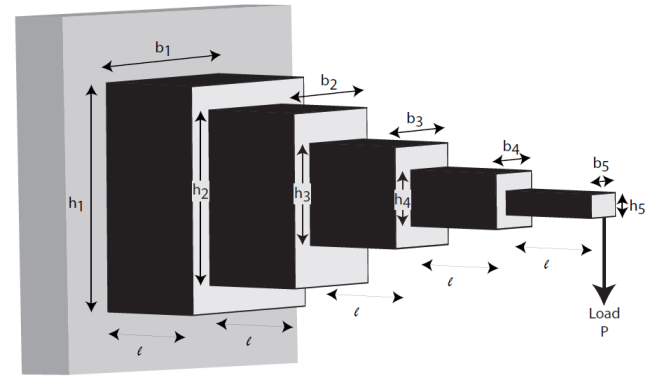 Note that the section nearest the support is constrained to have a width ( ) and height ( ) which is an integer value and this constraint has been honored by GA.
We can also ask ga to return the optimal volume of the beam. The engineers are now informed that the second and third steps of the cantilever can only have widths and heights that are chosen from a standard set. In this section, we show how to add this constraint to the optimization problem. Note that with the addition of this constraint, this problem is identical to that solved in . To solve this problem, we need to be able to specify the variables , , and as discrete variables. To specify a component as taking discrete values from the set , optimize with an integer variable taking values from 1 to , and use as the discrete value. To specify the range (1 to ), set 1 as the lower bound and as the upper bound. So, first we transform the bounds on the discrete variables. Each set has 4 members and we will map the discrete variables to an integer in the range [1, 4]. So, to map these variables to be integer, we set the lower bound to 1 and the upper bound to 4 for each of the variables. Transformed (integer) versions of , , and will now be passed to the fitness and constraint functions when the ga solver is called. To evaluate these functions correctly, , , and need to be transformed to a member of the given discrete set in these functions. To see how this is done, examine the MATLAB files cantileverVolumeWithDisc.m, cantileverConstraintsWithDisc.m and cantileverMapVariables.m. Now we can call ga to solve the problem with discrete variables. In this case are integers. This means that we pass the index vector 1:6 to ga to define the integer variables. xbestDisc(3:6) are returned from ga as integers (i.e. in their transformed state). We need to reverse the transform to retrieve the value in their engineering units. As before, the solution returned from ga honors the constraint that and are integers. We can also see that , are chosen from the set [2.4, 2.6, 2.8, 3.1] cm and , are chosen from the set [45, 50, 55, 60] cm. Recall that we have added additional constraints on the variables x(3), x(4), x(5) and x(6). As expected, when there are additional discrete constraints on these variables, the optimal solution has a higher minimum volume. Note further that the solution reported in  has a minimum volume of and that we find a solution which is approximately the same as that reported in . This example illustrates how to use the genetic algorithm solver, ga, to solve a constrained nonlinear optimization problem which has integer constraints. The example also shows how to handle problems that have discrete variables in the problem formulation.